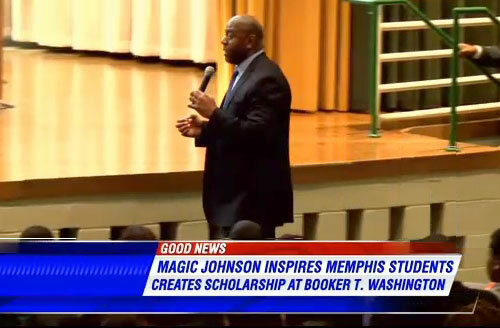 MEMPHIS, TN — Former Lakers point guard, Magic Johnson, was the guest speaker at Booker T. Washington High School where he spoke and mentored students sharing the message, “No matter where you’re from, you can make it. The Magic Johnson Foundation partnered with Cigna Healthcare and adopted Booker T. Washington High School, creating a $30,000 scholarship for seniors. Source: WMC Action News 5. When Johnson chose to venture from basketball to business, he said he needed direction. “My mentors were able to help me when I went down that road,” Johnson said. BTW warrior Skylyne Bright said most students need guidance after graduation. BTW basketball player Devin Oakley said he refuses to go down the wrong road, and that Johnson’s visit is motivation to follow his dreams. “I’m going to go to TSU to do nursing, and then go to the military and air force,” said Oakley. Johnson came down from the stage during his speech to speak openly and honestly with the students. “My message to these kids: if I can do it, I know they can do it,” said Johnson. Former Los Angeles Lakers point guard, Magic Johnson, led the Lakers to five NBA titles, was part of the Olympic Dream Team in 1992 and was inducted into the Basketball HOF in 2002. During his career, Magic achieved five NBA championships and three Most Valuable Player Awards. In 1994 he began his first year as the Lakers’ Vice President. In 1996 he was voted one of the 50 Greatest Players of All Time by the NBA, and in 2002, he was inducted into the Basketball Hall of Fame. ESPN’s Sports Century ranked Johnson #17 in their 50 Greatest Athletes of the 20th Century. In 2006, ESPN rated Johnson the greatest point guard of all time.